This week, Singapore and Germany concluded bilateral live-firing drills as part of the 10th iteration of a wider annual exercise between the two countries’ militaries. The development put the spotlight on a significant engagement within the broader and growing defense ties between the two countries. Singapore-Germany defense ties have been developing gradually over the years. A key development came in September 2005, when both countries signed a Defense Cooperation Agreement (DCA) to formalize their defense interactions, which currently include high-level visits and exchanges, policy dialogues, technological collaboration, and military exercises. Over the past few years, both sides have explored new areas of collaboration, with the cyber domain and handling fake news being a case in point. Both sides are working toward the formal inking of an enhanced DCA as the city-state has periodically done with its key partners, including Germany and the United States, which provide the land scarce city-state opportunities to train its military (See: “US-Singapore Defense Ties in the Spotlight Amid Trump-Lee Summit”). One of the features of the bilateral defense relationship is Exercise Panzer Strike, which they have held since 2009. Over time, the exercise has grown in both scale and complexity, and, importantly, the Singapore Armed Forces (SAF) are now able to train at the Oberlausitz Military Training Area (OMTA) in Germany. As I have noted before, OMTA, which is itself about a quarter the size of Singapore, has given the SAF the flexibility to train without the space constraints they experience at home, including concurrent live-firing of up to four ranges for armored units and engaging targets at greater range. These opportunities are important within the context of Singapore’s defense partnerships with key partners (See: “The Enduring Strategic Logic of the New Australia-Singapore Military Training Drill”). This year’s iteration of the exercise, the 10th in the series, is being conducted over two training windows as usual, one during spring and one during autumn. According to Singapore’s defense ministry (MINDEF), this year’s Exercise Panzer Strike will see approximately 750 and 500 SAF soldiers participating in the spring and autumn training windows respectively, which is comparable to the number of personnel officially disclosed last year. The exercise features servicemen from 48 SAR and the Armor Training Institute, as well as 14 Leopard 2SG Main Battle Tanks and 15 Bionix Infantry Fighting Vehicles. This week, as part of the ongoing exercise, SAF concluded a bilateral live-firing exercise with the Bundeswehr (German Armed Forces) at OMTA. 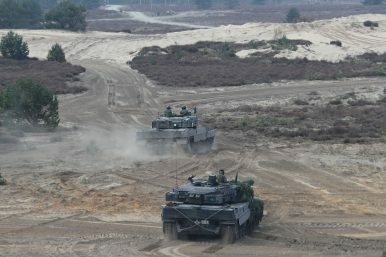 According to MINDEF, that component of the exercise involved 220 soldiers from the 3rd Company, 48th Battalion Singapore Armored Regiment (48 SAR), and their German Army counterparts comprising a tank battalion from the 10th Panzer Division.